There are not too many restaurants in Pattaya that have been around longer than the Sugar Hut which opened in 1984, so they must be doing something right. However, it is always interesting to go back to a restaurant like this to see whether there have been changes, is the ambience the same, is the food to the same standard? That was the case with our recent trip to the Sugar Hut, one of the best known restaurants that has been on tourist agendas for all of that time. The venue is quite spectacular and the entrance is at the top of Thappraya Road, but when you turn down the leafy laneway to the Sugar Hut, the outside world just disappears. You are suddenly driving through a tropical forest which has signs to advise you to watch out for rabbits! At the end of the lane is a semi-circular car parking area, complete with security personnel, armed with torches. It is actually the Sugar Hut Resort and Restaurant, as there are Thai villas dotted throughout the lush tropical setting, as well as three swimming pools and a jogging track. And some wild rabbits to give you that ‘natural’ feeling. However, we had returned to review the restaurant side of the resort. Set up on stumps, we went upstairs to the three high roofed salas set up for dining. You are asked to remove your shoes before entering, and in the Thai way, this seems all so natural. You forget about being in a commercial establishment. It is, after all, a Thai experience. The three wooden salas are built around a central wooden courtyard. Two of the salas have standard tables and chairs settings, but the third is in the old Thai tradition of sitting on the floor and eating from the low table. We chose the latter, deciding we should indeed go for the full Thai experience. After settling down we perused the menu, which has one page to explain the concept of Thai eating, with its range of different dishes and spiciness. The food on offer is mainly Thai, but there are also many European items in a section of its own (between B. 200-550) and covers chicken, fish, pork, steaks and pasta, plus a dedicated page of vegetarian dishes (all around B. 130), plus European soups at B. 120. The wine list is not extensive, but is not expensive. Australian and French predominate with most between B. 1,000-2,500. Beers are B. 120-130. However, the object of the exercise was the Thai experience and we chose a range of dishes which included spicy eggplant (B. 180), a mixed seafood with coconut milk and chilli paste (“Hor Mok” and B. 260), a southern masuman chicken (B. 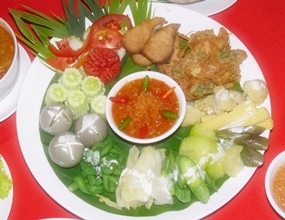 220), a shrimp paste with a chilli sauce garnish with crab eggs and fried fish and boiled vegetables. We also had some spring rolls with shrimp and some Thai coconut dessert served in hollowed out coconuts. It was certainly quite a full table, particularly as in the true Thai tradition, all the dishes came at once. 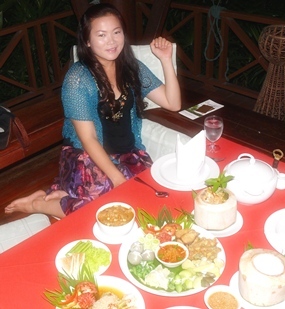 Madame, being Thai, reveled in the range of Thai tastes and was quite at home with the spiciness. She particularly enjoyed the shrimp paste with chilli garnish with crab eggs, fried fish and boiled vegetables, whilst I had to admit it was a little too spicy for me. With so many choices, however, I soon found that the chicken masuman was my kind of dish and I enjoyed every last drop! The creamy Thai dessert also set off any residual spiciness left on the palate, and one can see just why Thai food ends with the sweet desserts. Being an award-winning venue, and set in such beautiful surroundings, this is not a cheap restaurant, but in line with the price you would expect to pay at any of Pattaya’s international resorts. The Sugar Hut Resort and Restaurant, 391/18 Moo 10, Thappraya Road (top of the hill between South Pattaya and Jomtien, on the left coming from Pattaya), telephone 038 364 186, fax 038 251 689, website www.sugar-hut.com, email [email protected] Secure parking in the grounds. Open every day from 7 a.m. (breakfasts for those living in the resort) until midnight.